St. John Bosco, also known as Don Bosco, was a 19th century Italian priest and the founder of St. John Bosco High School. He devoted his life to the youth and believed that reason, religion, and loving kindness was essential to form the whole person. 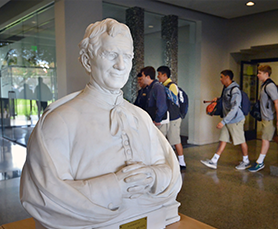 St. John Bosco’s innovative approach to teaching sparked a movement among educators that focused on the well-being of the young, called the Salesians. Salesian educators strive to instill within their students a work ethic based on mutual trust, confidence, respect and cooperation. With a small student body and student teacher ratio, our faculty and academic counseling staff have the advantage of devoting attention to the individual needs of each and every student. Bosco will challenge students with 20 Advanced Placement courses and an enriched Honors Program tailored to each individual student’s need. In addition, students may choose to participate in an academic pathways program that includes advanced level coursework and project-based learning experiences. The pathways encompass four different disciplines: Engineering, Bio-Medical, Sports Medicine, and Entrepreneurship. Our chemistry, biology and physics labs have been recently renovated and a new state-of-the-art learning commons is under construction where students can enjoy more than 4,500 square feet of modern working space, four collaboration rooms, and a makerspace with a robotics lab and individual work stations. Students who request extra academic support will benefit from the Support Team Education Plan (STEP). STEP addresses unique learning styles and facilitates full participation in the school’s curriculum. 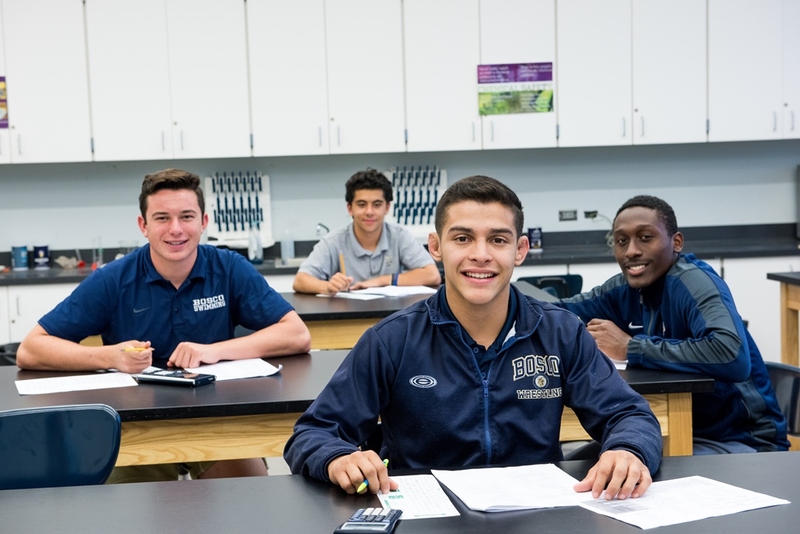 After four years at Bosco, every student will have met or exceeded the entrance requirements set by the University of California and California State Universities as well as a variety of electives to advance his development into manhood. Teachers strive to instill within their students a strong work ethic, confidence, respect and collaboration. Teachers also serve students as advisers, creating a welcoming environment where every young man can maximize his potential to become something greater than himself. Don Bosco’s Preventive System established that reason, religion and loving kindness is essential to forming the whole person. We seek to actualize Don Bosco’s educational vision in a new era by defining the characteristics of the young man we seek to form – The Bosco Man. Faith: A man of integrity, character and compassion, formed in the Catholic tradition. Intellect: A collaborative problem-solver; professional, informed, mature and prepared for life. Leadership: A decisive leader who takes initiative and practices good judgment in service to others. Citizenship: A kind, selfless contributor to his community and an advocate for social justice. Upon graduation, The Bosco Man will be an outstanding product of the Salesian educative model, advancing the legacy of the St. John Bosco brotherhood and the message of Jesus Christ. He will be prepared for the academic rigors of college and the opportunities of a professional career. Above all, he will be formed into a faith-driven leader of service for his family and his community. A man of integrity, character and compassion, formed in the Catholic tradition. A collaborative problem-solver; professional, informed, mature and prepared for life. A decisive leader who takes initiative and practices good judgment in service to others. A kind, selfless contributor to his community and an advocate for social justice.